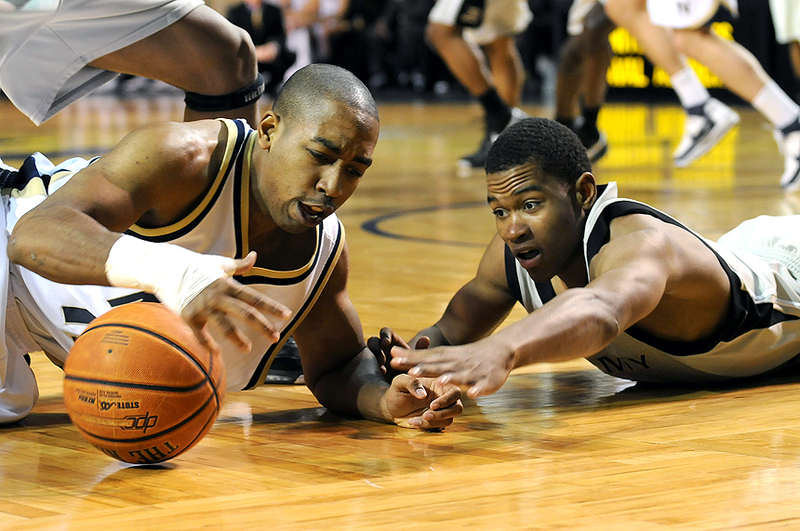 "Navy guard Chris Harris (no.5), who finished with 20 points, pushes the ball in transition during the second half against Army at Alumni Hall, Sunday, Jan. 27, 2008. 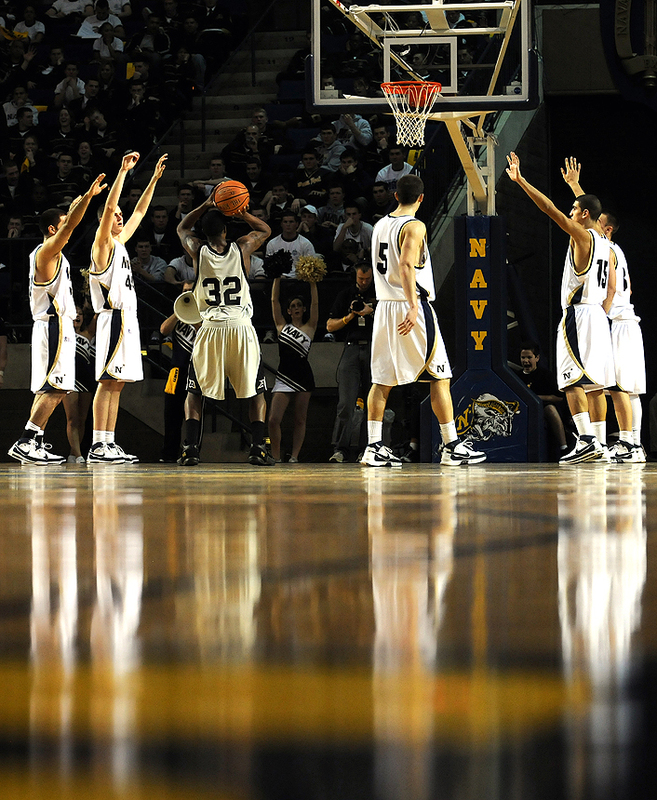 The Midshipmen fell to Black Knights 69-67." I don't know what it is about shooting in Annapolis, but something always makes my assignment difficult. A new e-mail popped up Friday night with an assignment to cover the Navy vs. Army men's basketball game Sunday afternoon. Since I've never shot basketball there, I e-mailed a contact name off their Web site to see if free wireless Internet was available. But I guess there was some sort of confusion and they thought I wanted parking on the Academy grounds. If you never been to the U.S. Naval Academy in Annapolis, Md., it's impossible to park on the yard. You must either take a shuttle (which I normally do) from the football stadium or park in town and walk. Otherwise, you will be face to face with a semi-automatic weapon. Nonetheless, after ten e-mails, it was cleared that I didn't need parking and they did have wireless Internet. Luckily, that was the extent of my troubles for the day. Man, was I am glad. The last assignment I covered down there I got caught in traffic for hours. No, I am not embellishing. Hours. Anyways, I feel as if I've been talking a lot about basketball and ambient lighting of recent, but that all ends now. The Academy has absolutely the best available lighting in Maryland. Well, the best I've ever experienced to date. I shot everything at 1/500 f/2.8 at 800ISO. I loved it. Although Navy had some mistakes in the first half, they had a small lead going into half time. They were pumped as they hit a buzzer beater shot, too. So I decided to just download and not start editing until after the game was over. The second half had a slow, dull pace to it until the last three minutes or so when Army starting marching back into the game. Get it? Marching. They made a some key plays that fired them up. 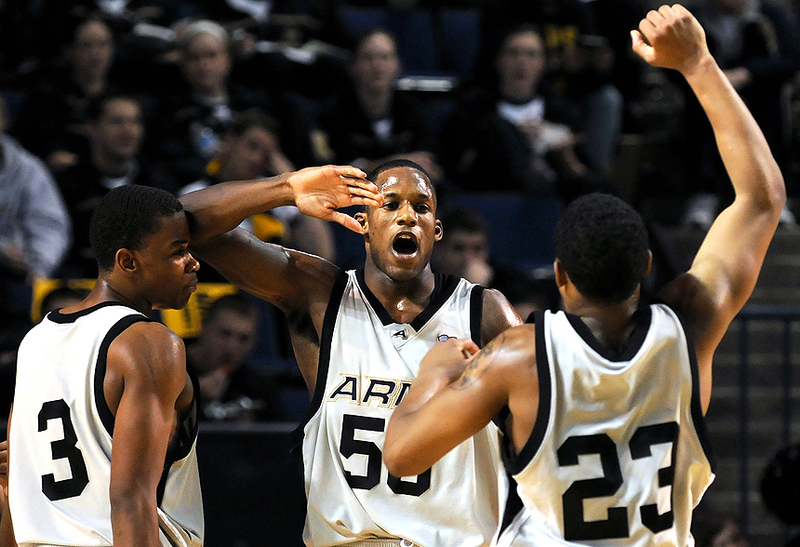 Navy would then commit some fouls, sending Army to the foul line and eventually into the lead. 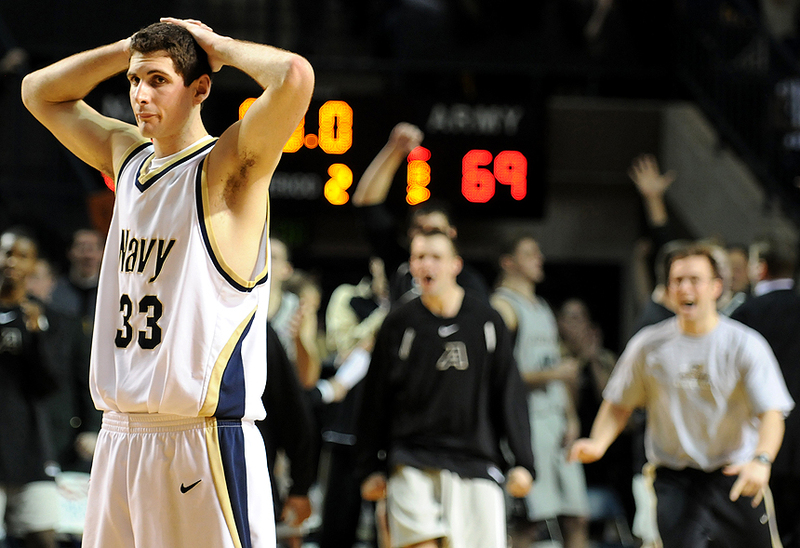 With seconds left Navy got two opportunities to tie the game, but couldn't make the shots and were left dejected. I wish he would have stepped a little to the player's right, revealing the score board in the image. But it happen so fast, I am happy with just any short of reaction. Overall, this is probably one of my better shot basketball games shot this image. The lighting fired me up, which was good because last night my indoor soccer team finally beat the New England Patriots of our league. They were pissed, but we came out victorious 7-5. A good positive day to kick-off classes that start this morning.